In this post I explore several branches of social science theory that support the social reactor model of settlement scaling. This is a continuation of my prior post, which explored the basis for comparing urban and village settlement systems. Like that post, this one is exploratory in nature, and I would really welcome feedback on these ideas. This post is a bit more academic and detailed than most in this blog, for which I apologize. Here is an outline of the scheme. Yes, I realize this is a motley collection of themes—some are well-worked out theories or theoretical approaches, one is a discipline, and others are specific research topics or claims. But as Ralph Waldo Emerson said, “A foolish consistency is the hobgoblin of little minds.” I am not any kind of theoretician, and I’m afraid this is the best I can do for now. Don’t like this scheme? Then help me out; send me comments and critiques. 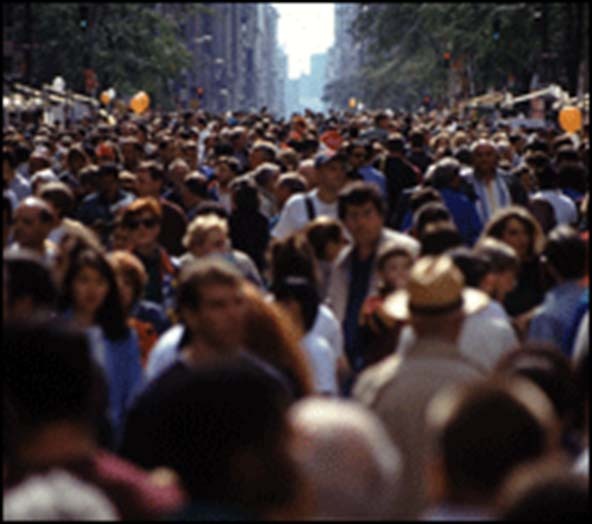 The first group of theories focus on the role of population growth—and population size—on society and behavior. This is a long-standing research theme in the social sciences. I divide this area into three categories. Social scientists have recognized the large-scale social consequence of increasing group size for more than a century. The great sociologist Georg Simmel noted in 1898: “Every quantitative extension of a group requires certain qualitative modifications and adjustments” (Simmel 1898:834).” The growth of larger social groups, and the association between group size and socio-political complexity, have been major themes in the literature on cultural evolution in anthropology. Quantitative analysis directed at this theme was common in anthropology in the 1950s and 1960s (Carneiro 1962; Naroll 1956), and this work even included some early settlement scaling analyses (Cook and Heizer 1965)! A popular topic of research on population change in the 1960s and 1970s was the role of “population pressure” in generating various social changes (Cohen 1977; Spooner 1972). The resulting consensus held that simplistic models positing population increase as the sole cause of political change were inadequate; for example, Carneiro’s (1970) model of population growth causing warfare, which in turn caused the rise of states, is rarely invoked now, except as a foil or a historical note. But narrower models, focused on economic and environmental variables—such as Netting’s (1993) model of population pressure causing agricultural intensification in smallholder farming—have fared better with time, even appearing in best-selling popular science books (e.g., M.E. Smith 2016a) (well, I hope I do sell a few copies......). The two relationships mentioned above—(1) group size has increased over time in many areas of the world; and (2) group size is strongly predictive of sociopolitical complexity—might be considered “stylized facts” in archaeology. That is, they are well-documented relationships whose explanation has been the subject of dispute. I am intrigued by the concept of stylized facts in economics, and I’ll probably blog about this on Publishing Archaeology soon. But the relevant conclusion here is that group size is important, and—in some circumstances—has causal effects on social and economic life. This is similar to the claims of the social reactor model, although the cultural evolutionary models tend to gloss over specific social interactions within set places in their pursuit of more general results. If this discussion does not seem sufficiently “theoretical,” then I’ll invoke the “demographic-structural theory” of Jack Goldstone (1991, 2002), further elaborated by Turchin and Nefedov (2009). This is a productive political-economy approach in economic history and historical sociology that melds population increase theory with structural models of power relations. Archaeologist Gregory Johnson (1982) coined the term “scalar stress” to refer to social stress or difficulties created by increases in the size of a social group. His focus was on the size of the decision-making group, and he analyzed the development of hierarchies of social decision making as group size increases. Research on scalar stress focuses on the negative aspects of larger social groups. The best-known archaeological example is Roland Fletcher’s (1995) model of thresholds in settlement size and density, caused by scalar stress. This kind of analysis of archaeological site size continues today (Alberti 2014). There is a large literature in social psychology on the role of population density in generating psychological stress (Evans 2001; Spruill 2010), and research on the “urban health penalty”—the negative health consequences of living in dense cities (Vlahov and Galea 2002; Vlahov et al. 2004)—follows a similar tack. In fact, if we step back a bit, there is a major historical line of research in sociology on the negative effects of growing city size. This is too big a topic to get involved in here (and I don’t know if very well......), but one element that remains a topic of discussion after many decades is “social disorganization theory,” concerning the negative social consequences of urban life, particularly in large cities (Kornhauser 1978; Kubrin and Weitzer 2003; Sampson 2004). Scalar stress and social disorganization theory are relevant to settlement scaling in that they emphasize the negative consequences of life in large cities. Urban scaling of contemporary cities shows that superlinear scaling is not only about positive economic outputs; crime, poverty, and disease rates also exhibit superlinear scaling (thanks to Deborah Strumsky for her nice lecture today at ASU, reminding us about superlinear scaling of disease levels). Social interactions in the built environment have both positive and negative consequences. Dual inheritance theory is about how human genes and culture evolve separately, yet inter-relatedly; they co-evolve. Starting with Boyd and Richerson (1985), this is now a major line of research in anthropology and biology (Henrich 2015; Richerson and Christiansen 2013). What does it have to do with scaling? A major focus in dual inheritance theory is the mechanisms of cultural transmission. How do people learn from others? How do new traits arise and spread through a population? What are the roles of skill, teaching, prestige, and conformity in the spread of knowledge? Many of these traits depend on population size. This research is relevant to settlement scaling in its analysis of how the size of social groups relates to technology and other cultural adaptations. No single person in any social group has all of the knowledge needed to survive or to reproduce the group’s culture. Successful cultures require the combined knowledge and skills of many members. Larger groups have a greater diversity of tools and concepts (Henrich 2015), and if a group gets too small, it can lose effective technological adaptations rapidly, as in ancient Tasmania (Henrich 2004). Unfortunately, the dual inheritance scholars have not thought much about how their models relate to settlements and urbanism; their models lack a spatial dimension. If technological diversity depends on group size, then perhaps larger settlements have distinctive technological attributes compared to smaller settlements. But the emphasis on learning and cultural transmission of dual inheritance research does relate to the social interaction basis of the social reactor model. By “community theory” I mean work from a political-economy perspective that studies communities as sites of social interaction. This perspective diverges from a common approach to communities in archaeology, in which the emphasis is on idealist and social constructionist models that claim communities are generated by shared meanings in people’s heads. For some discussion of these differences, see two posts on Publishing Archaeology: here, and here. I sometimes wish I worked in a discipline that didn’t have so much silliness and ridiculousness taken seriously as theory. The three sections that follow are not distinct theoretical approaches; they are major claims of the political-economy approach to communities. This approach—particularly these three claims—is broadly supportive of the social reactor model of settlements. Most definitions of community in the social sciences are based on three factors: social interaction, spatial locality, and some kind of common ties (Hillery 1955; Jabareen and Carmon 2010). My definition of neighborhood—intended to be useful for archaeologists—is quite similar (M.E. Smith 2010). Again, see my prior blog posts for a critique of the social constructionist views of community in archaeology (here, and here), or see my paper on quality of life (M.E. Smith 2016b). Social interaction is emphasized in a number of normative theories of successful communities. Anthropologists and archaeologists, take note: planning and other social scientists use the term “normative” in a very different way than it is used in anthropology and archaeology. Normative in these other fields means theory with an evaluative dimension; for example, theory about what makes for “good city design” (Lynch 1981) is called normative theory. I discuss this briefly in Smith (2011). How to use urban design to promote social interactions is a major component of normative planning theory. Social interactions—with friends, neighbors, and other residents—are seen as one of the prime indicators of successful cities and towns. Social interaction—particularly in reference to neighborhood physical facilities like parks, playgrounds, and pedestrian-friendly streets—is a key dimension of social cohesion in cities (R.A. Smith 1975). Urban planners give considerable attention to designing neighborhoods and streets that promote interactions (Kısar Koramaz 2014). Stable neighborhoods facilitate social interaction, which promotes social cohesion or integration (Brower 2011). Notice the role of face-to-face communication on the left side. 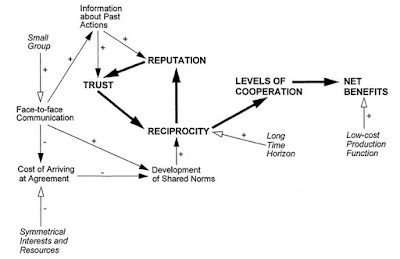 Basic social interactions within a community promotes trust, reputation and reciprocity. The upshot of this perspective on communities is that social interactions in a specific spatial locale have a variety of positive effects for residents. These effects are felt on both the individual and the group levels. 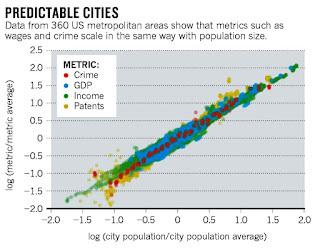 To these basic findings of social science research, the social reactor model of settlement scaling adds two things: (1) social interactions in a given built environment have an even wider range of specific outcomes than social-science research might suggest; and (2) they exhibit a surprising level quantitative regularity. 2014 Modeling Group Size and Scalar Stress by Logistic Regression from an Archaeological Perspective. PLOS-one 9 (3): e91510. 2002 Social Capital and Community Governance. The Economic Journal 112 (483): F419-F436. 1985 Culture and the Evolutionary Process. University of Chicago Press, Chicago. 2001 Gemeinschaft Revisited: A Critique and Reconstruction of the Community Concept. Sociological Theory 19: 1-23. 2011 Neighbors and Neighborhoods: Elements of Successful Community Design. APA Planners Press, Chicago. 1962 Scale Analysis as an Instrument for the Study of Cultural Evolution. Southwestern Journal of Anthropology 18: 149-169. 1970 A Theory of the Origin of the State. Science 169: 733-738. 1977 The Food Crisis in Prehistory: Overpopulation and the Origins of Agriculture. Yale University Press, New Haven. 1965 The Quantitative Approach to the Relation Between Population and Settlement Size. Reports, vol. 64. University of California Archaeological Research Facility, Berkeley. 2001 Crowding and Other Environmental Stressors. In International Encyclopedia of the Social and Behavioral Sciences, edited by Neil J. Smelser and Paul B. Baltes, pp. 3018-3022. Elsevier, New York. 1995 The Limits of Settlement Growth: A Theoretical Outline. Cambridge University Press, New York. 2011 The Triumph of Cities: How our Greatest Invention Makes us Richer, Smarter, Greener, Healthier, and Happier. Penguin, New York. 1991 Revolution and Rebellion in the Early Modern World. University of California Press, Berkeley. 2002 Population and Security: How Demographic Change can Lead to Violent Conflict. Journal of International Affairs 56: 3-21. 2004 Demography and cultural evolution: How adaptive cultural processes can produce maladaptive losses-The Tasmanian case. American Antiquity 69 (2): 197-214. 2015 The Secret of Our Success: How Learning from Others Drove Human Evolution, Domesticated our Species and Made us Smart. Princeton University Press, Princeton (in press). 1955 Definitions of Community: Areas of Agreement. Rural Sociology 20: 111-124. 2010 Community of Trust: A Socio-Cultural Approach for Community Planning and the Case of Gaza. Habitat International 34 (4): 446-453. 1982 Organizational Structure and Scalar Stress. In Theory and Explanation in Archaeology: The Southamton Conference, edited by Colin Renfrew, Michael J. Rowlands, and Barbara A. Wegraves, pp. 389-421. Academic press, New York. 2014 The Spatial Context of Social Integration. Social Indicators Research 119 (1): 49-71. 1978 The Social Sources of Delinquency Theory. University of Chicago Press, Chicago. 2003 New Directions in Social Disorganization Theory. Journal of Research in Crime and Delinquency 40 (4): 374-402. 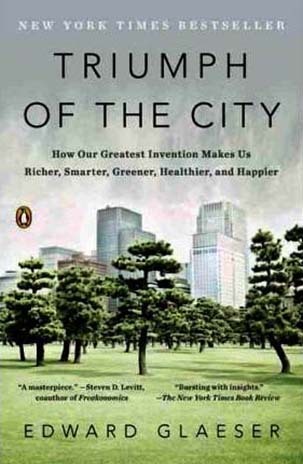 1981 A Theory of Good City Form. MIT Press, Cambridge. 1956 A Preliminary Index of Social Development. American Anthropologist 58 (4): 687-715. 1993 Smallholders, Householders: Farm Families and the Ecology of Intensive, Sustainable Agriculture. Stanford University Press, Stanford. 1990 Governing the Commons: The Evolution of Institutions for Collective Action. Cambridge University Press, New York. 2005 Understanding Institutional Diversity. Princeton University Press, Princeton. 2003 Better Together: Restoring the American Community. Simon and Schuster, New York. 2013 Cultural Evolution: Society, Technology, Language, and Religion. MIT Press, Cambridge, MA. 2004 Networks and Neighbourhoods: The Implications of Connectivity for Thinking about Crime in the Modern City. In Network Logic: Who Governs in an Interconnected World?, edited by Helen McCarthy, Paul Miller, and Paul Skidmore., pp. 157-166. Demos, London. 1898 The Persistence of Social Groups, II. American Journal of Sociology 3: 829-836. 2010 The Archaeological Study of Neighborhoods and Districts in Ancient Cities. Journal of Anthropological Archaeology 29 (2): 137-154. 2011 Empirical Urban Theory for Archaeologists. Journal of Archaeological Method and Theory 18: 167-192. 2016a At Home with the Aztecs: An Archaeologist Uncovers their Domestic Life. Routledge, New York. 2016b Quality of Life and Prosperity in Ancient Households and Communities. In The Oxford Handbook of Historical Ecology and Applied Archaeology (book in press), edited by Christian Isendahl and Daryl Stump. Oxford University Press, New York. 1975 Measuring Neighborhood Cohesion: A Review and Some Suggestions. Human Ecology 3: 143-160. 1972 Population Growth: Anthropological Implications. MIT Press, Cambridge. 2010 Chronic Psychosocial Stress and Hypertension. Current Hypertension Reports 12 (1): 10-16. 2004 Buzz: Face-to-Face Contact and the Urban Economy. Journal of Economic Geography 4 (4): 351-370. 1973 Do Communities Act? Sociological Inquiry 43: 209-240. 2009 Secular Cycles. Princeton University Press, Princeton. 2002 Urbanization, Urbanicity, and Health. Journal of Urban Health: Bulletin of the New York Academy of Medicine 79 (4-supplement 1): s1-s12. 2004 Cities and Health: History, Approaches, and Key Questions. Academic Medicine 79: 1133-1138. Nice post, Mike. What are your thoughts on how to measure social vectors for wholly prehistoric contexts? Archaeologists have been good at quantifying tangible urban infrastructure, but social interactions seem like the more important variable in defining urban life. Something approaching GDP/income could perhaps be calculating using certain artifact types or labor estimates for various tasks, and we could maybe get at the potential for large assemblies of people through architecture. But I don't see prehistorians picking up traces of crime, or successfully quantifying many of the artistic/aesthetic culture that make cities exciting places today. Maybe I'm not thinking creatively enough, though. - area vs. population (where population is estimated from house counts), finding the same density gradient as found in modern cities. Our medieval paper on this is just about ready for re-submission after revisions. And my student Rudy Cesaretti has a bunch of ethnographic cases with the same patterns, in his MA paper. - house size as a measure of wealth, using aggregate house area for a settlement as a measure of total wealth. This shows superlinear scaling for some North American tribal-level archaeological cases (paper by Scott Ortman, in press), and for an Andean case as well (paper by a bunch of us, just about ready to submit). - plaza area as a measure of something. Plaza area shows superlinear scaling with population in New Mexico pueblos, but it shows a strange (but regular) sub-linear relationship with population in two samples of Mesoamerican cities. That paper is still in the writing stage. - infrastructure. There don't seem to be ancient cases where we can quantify infrastructure in a big enough sample to look at scaling, although Scott has a post-doc working on Roman cities who may find the information. - volume of monumental architecture would be an obvious variable to look at, but its hard to know how to characterize it. Is this a wealth-related social output, or is it a kind of infrastructure? Or with a good sample, perhaps the scaling results could help answer that question. A Quality blog from your side about Settlement Scaling and Social Science Theory. Thank you for sharing it with us. It includes excellent stuff and the source that you have taken is very good so thank you once again for sharing it with us. "Wide Urban World" is a blog about cities as viewed from a broad historical and comparative perspective. As Winston Churchill said, "The farther back we look, the farther ahead we can see." I am an archaeologist who works on Aztec sites and Teotihuacan.I do comparative and transdisciplinary research on cities, and also households, empires, and city-states. I view my discipline, archaeology, as a Comparative Historical Social Science. I am Professor in the School of Human Evolution & Social Change at Arizona State University; Affiliated Faculty in the School of Geographical Science and Urban Planning; Fellow, ASU-SFI Center for Biosocial Complex Systems; Core Faculty in the Center for Social Dynamics Complexity. Also, I have an affiliation with the Colegio Mexiquense in Toluca, Mexico. "Urban Organization through the Ages" (a transdisciplinary project).